At the beginning of 2014 following a meeting with a client in Los Angeles I made the three or four hour drive over to Death Valley National Park to take some photos. I had every intention in going out to find the sailing stones on the Racetrack Playa. If you don’t know what those are click on the link and take a few minutes to read about the phenomenon. However, I ultimately for the sake of my rental car and because of the odd amount of rain the desert was getting during this period decided not to make the treacherous trip out there. If I ever make it back though I may rent a jeep and take the four hour trek out there and stay the night – the images I’ve seen of the tracks trailing these stones are pretty amazing. The Cottonball Basin is much easier to access and is located only about a half hour or so from the entrance of the park. The only challenging part in creating this image before the sun comes up is to find an interesting pattern of salt flats. In order to do that I went out the day before – with my GPS – and marked specific locations I wanted to head back to. I numbered them on my GPS and also took pictures that corresponded with those numbers. The night before I went through all those pictures and settled on this location to head to first thing in the morning. I liked that the salt flats were well defined and the geometrical shapes were easy to spot not only from right at my feet but also into the distance. These spots are not easy to find and the previous day I probably spent four or five hours walking a good ten miles in process to find a handful of spots like this that would be photogenic. I got lucky with the weather this morning as it was really clear and thus there was a nice alpenglow on the mountains as the sun was still below the horizon in the distance. Death Valley is an interesting place and it is huge. Driving from one end to another takes hours and given that it is desert and most of the ground is cracked, landscape is barren and there really isn’t any coverage of any kind anywhere it is somewhat boring to look at which makes the drive a bit challenging as well (compared to say Glacier National Park or Rocky Mountain National Park where there are mountains all over the place and the changes in elevation bring different trees, ecosystems, etc…). However, despite that if you do have a chance to visit and have the time to drive through it I would highly recommend it. Especially as close as it is to major tourist locations like Los Angeles and/or Las Vegas (about ninety minutes). 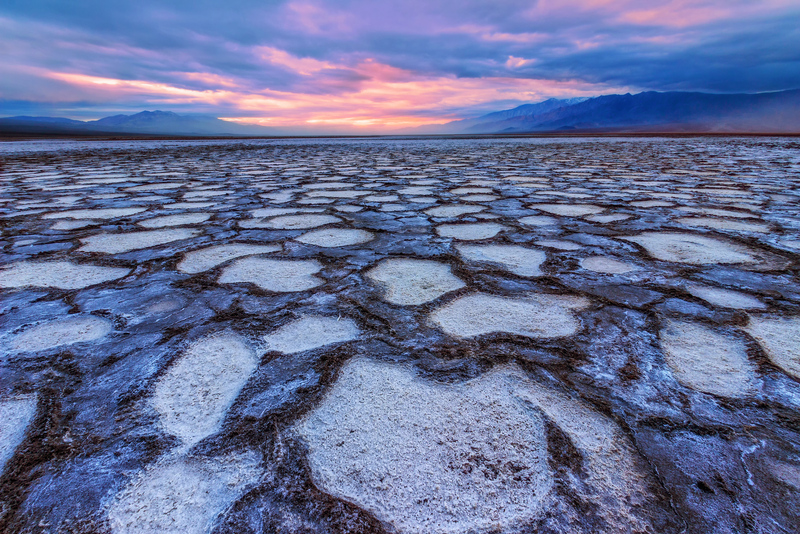 Most of the areas – like Cottonball Basin and Badwater Basin – are just off of the main roads and it is pretty easy to step out of your car and walk around. Just be sure to get back before dark because unlike parks with trails everything in Death Valley looks the same so if you are out at night and don’t know where your car is you are unlikely to find it until the morning. My first trip to Death Valley brought me to the first scenic lookout when entering the park from the Nevada side (Pahrump Valley I think) which is called Zabraskie Point. There were lots of photographers here on this morning and while the sunrise disappointed the clouds later in the 60-90 minutes that followed had us all pretty excited. I added a little tinting to it and a vignette to make it a little more interesting. I’ll try to get back to posting more frequently. It’s been a challenge lately as I’ve been working and traveling (for work with little downtime for ‘fun’ in between) a ton for the past month or so. October is going to be a tough month too but we are taking a break with a week long trip out to the Smoky Mountains in Tennessee. Standing at the top of the Mesquite Dunes in Death Valley while the sun rose in the early morning was a tremendous sight. The wind the night before smoothed the dunes so that they looked completely unspoiled. The air was still warm from the night before – temperatures dropped down to a ‘brisk’ 96 degrees overnight so it was probably broaching a 100 at this point. I was sweating profusely from the climb to the top – it may not look like much but climbing the dunes is a struggle as the sand slides from under your feet. Often you take two steps forward just to fall three steps further back. Ultimately, I made it to the top. I framed this shot with the dune hitting the lower left corner but with it leading the eye out towards the sun before turning back towards the mountains and smaller dunes in the distance. As the sun crested above the mountains I opened up the aperture to make sure I was able to see the burst of the sun and its rays streaming into the frame as well. Death Valley is a fun place to photograph and I certainly had more luck this time through with the dunes than I did on my trip in early 2014. After a long night out in Death Valley National Park as I stood atop the Mesquite Dunes in Death Valley National Park I noticed this lone bush in the distance sitting amongst the large dunes all around it. It stood out in my mind since it was surviving where very little else does. In the Mesquite Dunes area there are some trees – nearer to the road – but amongst the dunes there isn’t much life existing. Thus, it seemed a little remarkable to me that this little bush was staying strong. As I framed it up I tried to isolate the bush against the dunes in the background – and the texture of those windswept dunes really started to standout. The low sun hanging in the air also cast a long shadow which interested me as well so I tried to frame it so the shadow extended into the foreground.